Back in the 1970s, one of TV's most popular sitcoms was "Sanford and Son." 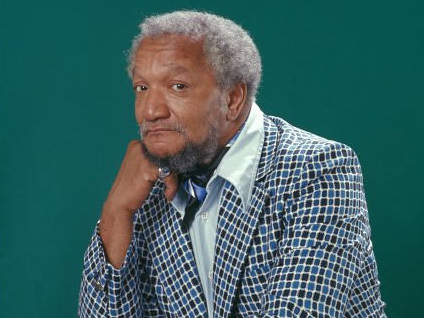 Norman Lear's groundbreaking series about a black junk dealer in Los Angeles ran for six seasons and starred Redd Foxx as the sarcastic, irascible Fred Sanford. His colorful life is the subject of a new biography from Michael Starr, TV columnist for the New York Post, called "Black and Blue: The Redd Foxx Story." Foxx was, Starr told "Early Show on Saturday Morning" co-anchor Russ Mitchell, "a guy who just deserves his due. He was such a groundbreaker, literally grew up on the streets of St. Louis and Chicago, didn't even graduate from high school, and here he was, in 1972, one of the top-rated stars on television. He was a groundbreaker in standup comedy and television." "Sanford and Son," Starr observes, "was controversial at the time, because there had never been an African-American who had headlined a major network show. Bill Cosby had done 'I Spy,' but he was a co-star. This was an African-American show built around a largely African-American cast, (and it) shot almost to (number) one or two (in the ratings) at soon as it premiered. "And it was a little controversial, because even some people in the African-American community felt it wasn't a fair portrayal. Redd always felt the opposite. Here you had a show set in Watts, where there had been riots several years before, basically about a father who loves his son and doesn't want his son to leave the house." Foxx's act before "Sanford and Son" was, Mitchell pointed out, "pretty blue. He was pretty raunchy." So, how did Foxx, of all people, wind up on a network TV sitcom? Foxx also had "major drug issue going on," Mitchell noted. "He had a cocaine habit and was very open about it," Starr says. "He wore a (cocaine) spoon around his neck and, at the table reads (of scripts) for 'Sanford and Son,' would actually take the spoon and snort (the cocaine). He was very open about it. But at that time in Hollywood, drugs were pretty rampant. It just was an open secret. And it never affected his on-air work." Foxx was making "tremendous amounts of money" from the series, and doing standup in Las Vegas, Mitchell said, but had "major problems" with the Internal Revenue Service. "Redd just never believed in paying his taxes," Starr explained. "He knew what he was doing. He knew he wasn't paying his taxes. And it really caught up to him at the very end. There had been some hiccups through the years (in which) he had paid it back and then he got into more trouble. "In 1989, right before he died, the IRS came and raided his house in Las Vegas. They took just about everything he owned, including a watch that Elvis Presley had given him. They just ripped it right off his wrist. He got some of it back before he died and, ironically, had just worked out a payment agreement with the IRS several days before he died on the set of his (last) sitcom." Foxx was, Mitchell remarked, "making a comeback in many ways" with that sitcom, "The Royal Family," which also starred Della Reese, when Foxx died suddenly. "He died on-set,' Starr says. "And people thought he was joking around - he clutched his chest (much like his famous, frequent move from "Sanford and Son"), and people were like, 'Come on, Redd, get up.' He didn't get up. It was 'the big one' (as Foxx's character on "Sanford and Son" called it). They rushed him to a hospital across the street, where he lingered for several hours and then died later that night." But, Starr says, his legacy lives on in the likes of Eddie Murphy, Chris Rock and many others.